Original Editors - Ann Bedwell from Bellarmine University's Pathophysiology of Complex Patient Problems project. Hodgkin’s Lymphoma, also known as Hodgkin’s disease, is a “chronic, progressive, neoplastic disorder of lymphatic tissue characterized by the painless enlargement of lymph nodes with progression to extralymphatic sites such as the spleen and liver.” It may also metastasize to bone marrow and other organs. The sites initially affected are the lymph glands in the neck or groin, usually on one side. This type of cancer is malignant and may travel to other parts of the body. As it progresses, it may compromise the body’s ability to fight infection since it is attacking the immune system. Hodgkin’s lymphoma is differentiated from other cancers and Non-Hodgkin’s lymphoma by the type of cell involved. The Reed-Sternberg cell is “part of the tissue macrophage system and have twin nuclei and nucleoli that give them the appearance of owl eyes.” There are two subtypes of Hodgkin’s lymphoma, classic and nodular lymphocyte-predominant. Classic Hodgkin’s lymphoma is further divided into four categories based on what the cell looks like under a microscope. These are Lymphocyte-rich classical Hodgkin lymphoma, Nodular sclerosis Hodgkin lymphoma, Mixed cellularity Hodgkin lymphoma, Lymphocyte-depleted Hodgkin lymphoma. Hodgkin’s can occur in children and adults at any age, but peaks around age 25-30 years and after 55 years. Men are typically diagnosed with Hodgkin’s more than women. “Children younger than 5 years rarely develop this disease, while only 10% of HL cases occur in children 16 years old and younger.” The nodular lymphocyte-predominant Hodgkin’s lymphoma (LPHL), has a peak incidence around the fourth decade of life. Approximately 7800 cases of HL are diagnosed in the United States each year. Lymph nodes that are soft and tender to touch are usually indicative of infection. Any changes in the shape, size, consistency, or mobility are red flags and should be reported to a physician immediately. Symptoms may occur due to the obstruction or compression of structures by the enlarged lymph nodes. This may cause edema in the neck, face or right arm due to blockage of the superior vena cava or renal failure from blockage of the urethra. Many of these signs and symptoms may be due to other health problems. No associated co-morbidities were found although there are risks associated with chemotherapy and radiation therapy described further in the Medications section. There are several treatments used in patients with Hodgkin’s lymphoma which are discussed in the Medical Management section. Below is a list of medications that are used during chemotherapy. Chemotherapy is a mix of specific drugs that are introduced through the bloodstream to kill tumor cells. Most of the drugs are given intravenously, but some can also be given orally. Chemotherapy is given in cycles with a rest period. The amount of time spent in each cycle is determined by the type of drug used and stage of cancer. Health professionals, such as oncologists, agree that the use of chemotherapy and radiation has different effects on children than it does on adults. Most all children patients are treated with chemotherapy with or without radiation unless the patient has “stage I, completely resected, nodular lymphocyte-predominant Hodgkin lymphoma, Hodgkin’s lymphoma.” These patients may receive surgery only. Radiation dosed for an adult can cause profound harm to musculoskeletal growth and increase risk for cardiovascular disease in children. There are also gender differences for treatment in children. Alkylating Agents: Some have been “shown be to associated with an increased risk for therapy-related leukemia.” Therefore nonalkylating agents were developed, including ABVD (doxorubicin, bleomycin, vinblastine, and dacarbazine). Adults in early stages of Hodgkin’s lymphoma may receive chemotherapy, combined modality therapy or radiation therapy alone. Usually these patients “receive either four courses of ABVD or two courses of ABVD plus radiation.” Adults with stage III or IV Hodgkin’s lymphoma with favorable prognosis will receive six courses of ABVD while patients with unfavorable prognosis will receive BEACOPP. MOPP: mechlorethamine, vincristine, procarbazine and prednisone. Pregnant Women: Each patient must be looked individually when they present with Hodgkin’s lymphoma and are pregnant. If the HL is in the early stages and appears to be growing slowly, “patients can be followed carefully with plans to induce delivery early and proceed with definitive therapy.” These patients can also receive radiation therapy if shielded properly. “Investigators at M.D. Anderson reported no congenital abnormalities in 16 babies delivered after the mothers had received supradiaphragmatic radiation while shielding the uterus with five half-value layers of lead.” There are, however, risks that minimal scattered radiation could occur outside the radiation field and cause future malignancies in the baby. When a patient has HL in the 2nd half of their pregnancy, the cancer must be monitored carefully until they are induced into labor. If the patient is in a more advanced stage of cancer, vinblastine alone can be used because it has no associated fetal abnormalities with it. “Steroids are employed both for their antitumor effect and for hastening fetal pulmonary maturity.” Also, a combination of ABVD seems to be safe to use in the second half of the pregnancy. A combination of drugs is usually recommended over a single drug. Biopsy of lymph tissue that looks be involved and bone marrow. Once the sample is taken, it is checked for Reed-Sternberg cells that indicate Hodgkin’s lymphoma. Once tests reveal that a patient has Hodgkin’s lymphoma, additional tests will be done to see if the cancer has spread therefore finding out what stage the cancer is in. Once the cancer stage has been found, future treatments can be planned and initiated. The exact cause of Hodgkin’s lymphoma is unknown. HL begins with an abnormal B cell, which is a type of lymph cell that is important in the body’s response to foreign intruders. When these B cells become abnormal they are called Reed-Sternberg cells. This cell continues to divide and make copies, but unlike normal cells, it does not die. “The genes have the ability to mimic transmembrane receptors and activate the transcription factor NF-кB. NF-кB, through its function of regulating dozens of genes within the cell, plays a key role in the proliferation and survival of the malignant clones.” Products of these genes include cytokines and chemokines. Most cytokines, mostly interleukins produce an environment where the Reed-Sternberg cells can flourish. These interleukins may attract inflammatory cells to survive as it is shown in the lab that they cannot survive without the inflammatory cells. Other interleukins restrain the activation of T cells that are normally used to destroy any unusual cell, while others “act as growth factors, encouraging proliferation, metastasis and angiogensis.” The abnormal B cell is unable to die due to a protein called c-FLIP that usually signals cell death but is not able to function in the circumstances. Therefore the abnormal B cell is undying. The cells build up while attracting normal immune cells to cause tissue growth in the lymph nodes.This mass of tissue growth is called the tumor. The reason that these B cells are malignant is unknown, but recent evidence implies that it begins from an infection or inflammation. Genes from a virus called Epstein-Barr have been found in half of all HL cases. Once the lymphoma begins in the lymph nodes, typically the neck, axilla or groin, it can travel to all other lymph nodes in the body then spread outside of the lymph nodes into any part of the body. Hodgkin’s lymphoma primarily affects the lymph nodes in the neck, axillas, and groin but can also affect and grow to the spleen, liver, tonsils, thymus and bone marrow, which are all part of the lymphatic system. The spleen, composed of blood and lymphoid tissue, is where the final destruction of red blood cells, filtration and storage of blood takes place as well as production of lymphocytes. The liver is a vascular, glandular organ that secretes bile to aid in digestion and changes substances in blood that passes through it. The tonsils are masses of lymphoid tissue near on either side of the throat. The thymus gland is composed of lymph tissue and functions in cell-mediated immunity by developing T cells. This gland is highly active in the younger population, then disappears with age. Bone marrow is the inner part of the bone where blood cells are made. B cells, which are white blood cells that help to aid in fighting infection. These B cells are the particular cells in Hodgkin’s lymphoma that become abnormal and begin the multiply to form a tumor. Stages I and II: treated with local radiation therapy, chemotherapy, or both. Partial resection or debulking: used when only part of the tumor can be removed. Complete resection: the whole tumor is removed. 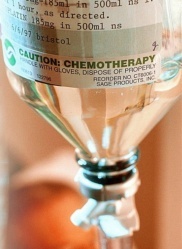 Chemotherapy: Chemotherapy is a mix of specific drugs that are introduced through the bloodstream to kill tumor cells. Most of the drugs are given intravenously, but some can also be given orally. Chemotherapy is given in cycles with a rest period. The amount of time spent in each cycle is determined by the type of drug used and stage of cancer. 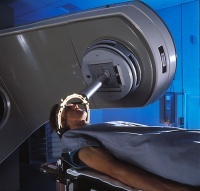 Radiation Therapy: Radiation therapy uses high energy x-rays to kill cancer cells and decrease pain. The duration of radiation therapy depends on what stage the cancer is in. Radiation is confined to a certain area, killing the cells in only that area. It is usually combined with chemotherapy and rarely used by itself. Most children who receive radiation are given a low-dose. Biotherapy or tumor immunotherapy uses a pharmacological approach to genetically engineer antibodies that specifically attack antigens on cancer cells. Bone marrow or stem cell transplantation may be used if the cancer returns or if the patient is not responding to treatment. Bone marrow or stem cells are taken from the patient, frozen and stored. The patient then receives high dose chemotherapy to destroy all the cancerous cells. Then the frozen marrow or stem cells are injected into the body through the patient’s veins. Physical therapy for patients with Hodgkin’s lymphoma focuses on cardiovascular and pulmonary health, strength, and flexibility in order to improve quality of life and reduce symptoms produced from the cancer and treatments. Most physical therapy sessions focus on activities of daily living, but also focus on the ability to reduce fatigue. The ability to improve cardiovascular and pulmonary health along with strength and flexibility will allow patients the ability to help their tolerance to chemotherapy and radiation while maintaining or improving their ability to do everyday activities. In a literature review by Courneya and Friedenreich, 24 empirical studies that were published between 1980 and 1997 showed that physical exercises and activity has a positive effect on quality of life in patients with cancer. Physical activity is able to increase functional health as well as psychological and emotional welfare. Nelson JP. Perceived health, self-esteem, health habits, and perceived benefits and barriers to exercise in women who have and who have not experienced stage I breast cancer. 1991. Patients self reported exercises they did posttreatment. Healthy behaviors showed a positive relationship with self-esteem. Young-McCaughan S, Sexton DL. A retrospective investigation of the relationship between aerobic exercise and quality of life in women with breast cancer. 1991. Patients self reported exercise during or after treatment. Patients who exercised reported a higher QOL. Baldwin MK, Courneya KS. Exercise and self-esteem in breast cancer survivors: An application of the exercise and self-esteem model. 1997. Patients self reported mild, moderate or strenuous exercise during or after treatment. Strenuous physical activity related positively with self-esteem and physical competence. Bremer BA, Moore CT, Bourbon BM, Hess DR, Bremer KL. Perceptions of control, physical exercise, and psychological adjustment to breast cancer in South African women. 1997. Patient’s self reported posttreatment exercises. No difference was found between patients that exercised and those that did not. Courneya KS, Friedenreich CM. Relationship between exercise pattern across the cancer experience and current quality of life in colorectal cancer survivors. 1997. Courneya KS, Friedenreich CM. Relationship between exercise during cancer treatment and current quality of life in survivors of breast cancer. 1997. Self reported mild, moderate and strenuous exerciseprediagnosis, during treatment and after treatment. Patients who maintained an exercise program from pre- to post-treatment reported the highest QOL. BuettnerLL. Personality changes and physiological changes of a personalized fitness enrichment program for cancer patients. 1980. Exercise sessions with cardiovascular, strength and flexibility during post-treatment. Experimental group showed an increase in strength, functional capacity and personality. Winningham ML. Effects of a bicycle ergometry program on functional capacity and feelings of control in women with breast cancer. 1983. Patients exercised on a cycle ergometer during chemotherapy. Experimental group increased their functional capacity. Cunningham BA, Morris G, Cheney CL et al. Effects of resistance exercise on skeletal muscle in marrow transplant recipients receiving total parenteral nutrition. 1986. Exercise following bone marrow transplant. Experimental group maintained creatine exertion level. MacVicar MG, Winningham ML. Promoting the functional capacity of cancer patients. 1986. Exercise on cycle ergometer during chemotherapy. Experimental group increased functional capacity, where controls decreased. Winnginham ML, MacVicar MG. The effect of aerobic exercise on patient reports of nausea. 1988. Exercise on a cycle ergometer during chemotherapy. Experimental group had a larger decrease in nausea. Decker WA, Turner-McGlade K, Fehir KM. Psychosocial aspects and the physiological effects of a cardiopulmonary exercise program in patients undergoing bone marrow transplantation for acute leukemia. 1989. Home-based exercise program before and after bone marrow transplant. Patients exhibited a decreased aerobic capacity and weight loss. MacVicar MG, Winningham ML, Neckel JL. Effects of aerobic interval training on cancer patients’ functional capacity. 1989. Exercise on a cycle ergometer during chemotherapy. Experimental group increased their functional capacity. Winningham ML, MacVicar MG, Bondoc M, Anderson JL, Minton JP. Effect of aerobic exercise on body weight and composition in patients with breast cancer on adjuvant chemotherapy. 1989. Exercise on a cycle ergometer during chemotherapy. Experimental group decreased their percent body fat and increased their lean body mass. Pfalzer LA. The responses of bone marrow transplant patients to graded exercise testing prior to transplant and after transplant with and without exercise training. 1990. Patient’s exercised on cycle ergometer after bone marrow transplant. Patient’s showed an increase in VO2, decreased depression and fatigue. Peters C. Ausdauersport als rehabilitationsmassnahme in der krebs-nachsorge. 1992. Patient’s exercised on a cycle ergometer. Patient’s showed an increase in natural killer cell activity. Seifert E, Ewert S, Werle J. Exercise and sports therapy for patients with head and neck tumors. 1992. Group exercise showed favor in the experimental group but there wasn’t a significant difference with the control group. Sharkey AM, Carey AB, Heise CT, Barber G. Cardiac rehabilitation after cancer therapy in children and adults. 1993. Exercises showed an increase in peak oxygen uptake and ventilator anaerobic threshold. Mock V, Burke MB, Sheehan P, et al. A nursing rehabilitation program for women with breast cancer receiving adjuvant chemotherapy. 1994. Walking program showed an increase in physical functioning and fewer symptoms than the control group. Nieman DC, Cook VD, Henson DA, et al. Moderate exercise training and natural killer cell cytotoxic activity in breast cancer patients. 1995. Walking and weight training program during post-treatment showed an increase in the 6 minute walk test and a decrease in heart rate. Dimeo F, Bertz H, Finke J, et al. An aerobic exercise program for patients with haemotological malignancies after bone marrow transplantation. 1996. Treadmill walking post-bone marrow transplant showed an increase in physical performance. Dimeo F, Tilmann MHM, Bertz H, et al. Aerobic exercise in the rehabilitation of cancer patients after high dose chemotherapy and autologous peripheral stem cell transplantation. 1997. Treadmill walking showed an increase in maximum performance and hemoglobin levels while decreasing fatigue. Dimeo F, Fetscher S, Lange W, Mertelsmann R, Keul J. Effects of aerobic exercise on the physical performance and incidence of treatment-related complications after high-dose chemotherapy. 1997. Biking by use of a bed ergometer showed an increase in functional capacity and a decrease in pain and length of hospital stay. Mock V, Dow KH, Meares CJ, et al. Effects of exercise on fatigue, physical functioning and emotional distress during radiation therapy for breast cancer. 1997. Home walking program during radiation increased patient’s functional capacity and decreased fatigue. ↑ 1.0 1.1 1.2 1.3 1.4 1.5 1.6 Goodman CC and Snyder TK. Differential Diagnosis for Physical Therapists: Screening for Referral. 4th edition. St. Louis, Missouri: Saunders Elsevier, 2007. ↑ 2.00 2.01 2.02 2.03 2.04 2.05 2.06 2.07 2.08 2.09 2.10 2.11 2.12 2.13 2.14 2.15 2.16 2.17 Zieve D, Chen Y. Hodgkin’s Lymphoma. http://www.nlm.nih.gov/medlineplus/ency/article/000580.htm. Updated March 3, 2010. Accessed on February 27, 2011. 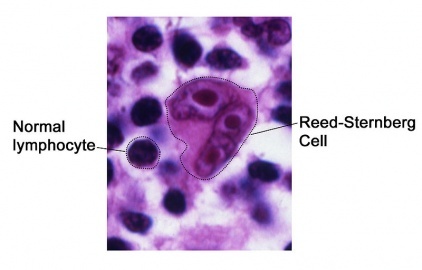 ↑ Reed-Sternberg cell. http://search.creativecommons.org/?q=reed-sternberg%20cells. Accessed on February 27, 2011. ↑ 4.00 4.01 4.02 4.03 4.04 4.05 4.06 4.07 4.08 4.09 4.10 4.11 4.12 4.13 4.14 4.15 4.16 Mayo Clinic Staff. Hodkgin’s lymphoma (Hodgkin’s Disease). http://www.mayoclinic.com/health/hodgkins-disease/DS00186. Updated November 5, 2010. Accessed on February 27, 2011. ↑ 5.00 5.01 5.02 5.03 5.04 5.05 5.06 5.07 5.08 5.09 5.10 Goodman CC, Fuller KS. Pathology: Implications for the Physical Therapist. 3rd edition. St. Louis, Missouri: Saunders Elsevier, 2009. ↑ 6.00 6.01 6.02 6.03 6.04 6.05 6.06 6.07 6.08 6.09 6.10 6.11 6.12 6.13 6.14 6.15 6.16 6.17 6.18 National Cancer Institute. Hodgkin lymphoma. http://www.cancer.gov/cancertopics/types/hodgkin. Accessed on February 27, 2011. ↑ UCTV. Conversations with History: The Story of Hodgkin’s Disease. http://www.youtube.com/watch?v=jBzMp-pnfcA. Accessed on February 27, 2011. ↑ 8.0 8.1 8.2 8.3 Altekruse et al. SEER Stat Fact Sheet: Hodgkins lymphoma. http://seer.cancer.gov/statfacts/html/hodg.html. Updated 2009. Accessed on February 27, 2011. ↑ Chemotherapy. http://www.dailymail.co.uk/news/article-1017418/Can-starving-help-combat-cancer.html. Accessed on March 24, 2011. ↑ Head and Neck lymph nodes exam. http://doctorsgate.blogspot.com/2010/05/head-and-neck-lymph-nodes-exam.html Accessed on March 24, 2011. ↑ Lymph system. 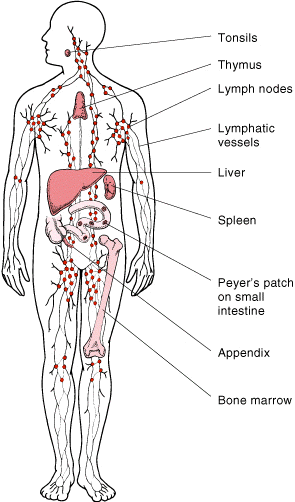 http://search.creativecommons.org/?q=lymph%20system. Accessed on February 27, 2011. ↑ National Institutes of Health. Medical Dictionary. http://www.nlm.nih.gov/medlineplus/mplusdictionary.html. Updated July 11, 2010. Accessed on February 27, 2011. ↑ 13.0 13.1 Billek-Sawhney B, Wells CL. Oncology considerations for the patient in acute care. Acute Care Perspectives. 2009; 18: (4): 3-24. ↑ Biomedical Communications. http://www.biocom.arizona.edu/showproject.cfm?project=52. Accessed on March 24, 2011. ↑ Cancer Treatment Centers of America. Hodgkins Disease Treatments - Complementary and Alternative Medicines. http://www.cancercenter.com/hodgkins-disease/complementary-alternative-hodgkins-disease-treatment.cfm. Updated October 3, 2007. Accessed on February 27, 2011. ↑ Courneya KS, Friedenreich CM. Physical exercise and quality of life following cancer diagnosis: a literature review. Ann Behav Med. 1999; 21: (2): 171-179. ↑ Alarcon PA. Pediatric Hodgkin Disease: Differential Diagnoses & Workup. http://emedicine.medscape.com/article/987101-diagnosis. Updated December 2, 2008. Accessed on February 27, 2011. ↑ MDGuidelines. Hodgkin’s Disease. http://www.mdguidelines.com/hodgkins-disease/differential-diagnosis. Accessed on February 27, 2011.